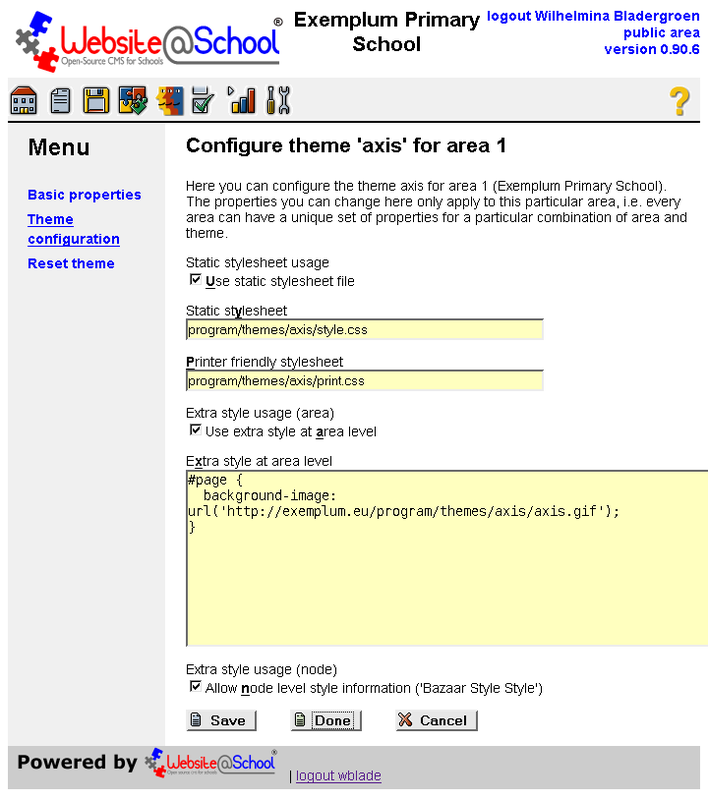 Axis is an images theme, i.e. well suited for presenting visual material. For its features, please see paragraph 2.2 Theme configuration. Tips for this theme are discussed in 3. The theme in practice:tips. At first glance, it seems that Axis is built as three vertical columns. On the left side of the screen is an image, taking about 1/3rd of the screen width. 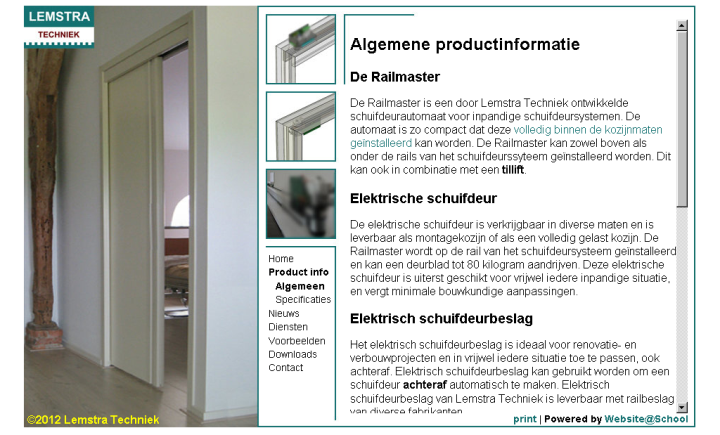 In the middle is a small vertical column, taking about 1/6th of the screen width in which, from top to bottom ,three images and a vertical menu bar are visible. The third column, taking about half the screen width is used for the content. 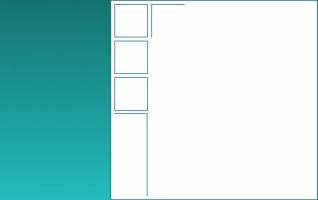 In fact, there is only one image, created with one big image, three small images and a lot of white space for the content. In paragraph 3. The theme in action: tips we will discuss the details. The extra style information shows the location of one image axis.png that is used for this theme. Please see also section 4. The theme in action: tips on how to use Bazaar Style Style. Static style sheet usage, Static style sheet, Extra style usage (area), Extra style at area level, Extra style usage (node): These Bazaar Style Style options are the same for every theme and are extensively discussed in chapter Bazaar Style Style, paragraph 4.1 BSS at Area level. In this paragraph we discuss some particular tips that apply to this theme. We assume you have read about the concept of Bazaar Style Style in the Viewpoints chapter, paragraph 4.1 Cascading Style Sheets. And we assume you have studied the practical side of BSS in the Configuration manager chapter, paragraph 3.4 Configure theme 'Theme Name' for area n.
To create images, chapter Theme Sophia, paragraph 4.2 Creating stencil files gives some hints when using free programs and how to create an image. Use blanco.jpg or create a canvass of 955x600 pixels. Save it in your preferred background color as .png file. A good paint program is mtPaint by Mark Taylor, please see notices in Theme Sophia, paragraph 4.2 Creating stencil files. With a screen ruler measure the size of the picture in the picture of 955x600 pixels. For example, the green vertical image is 332x600 pixels. Create a new canvass, for example of 332x600 pixels, or find an image of that size, or with a screenshot program cut a part from an image. Save it as .png file. Open the small image in the paint program, select all and copy. Next open the 955x600 image and pate the small image in it. Save your work. The described operations may differ in the different paint programs. We used mtPaint. Notice that file.php is used. This program is necessary because the image is not located under the program directory but in the data directory. So far extra style has been added at Area level. That means every section and page in the Area gets the same background. It's possible to overrule this Area wide background by adding different background images, for example, to all pages in a section or even add a different background to one page. Go to the Page Manager. In the Page Manager, click on the section name or page name or its pencil icon. The Edit basic properties of page/section nn dialogue opens. In the Menu, click Advanced. The Edit advanced properties of section/page nn dialogue opens. Save your work and see that all pages in that section have the same background, or that a particualer page has its own bakcground image. As you can see in the stylesheet, the page width is 955 pixels, the header width is 338 pixels and the menu is 92 pixels wide with a margin in the menu of 8 pixels. When we remove the menu we have to fill the 'gap' by enlarging the header width to 338+96+8=442 pixels. The 'float' property is set to value 'none'. With the property 'position' we set the desired position of the menu. The upper left corner of the menu is 150 pixels from the left and top sides of the browser window. 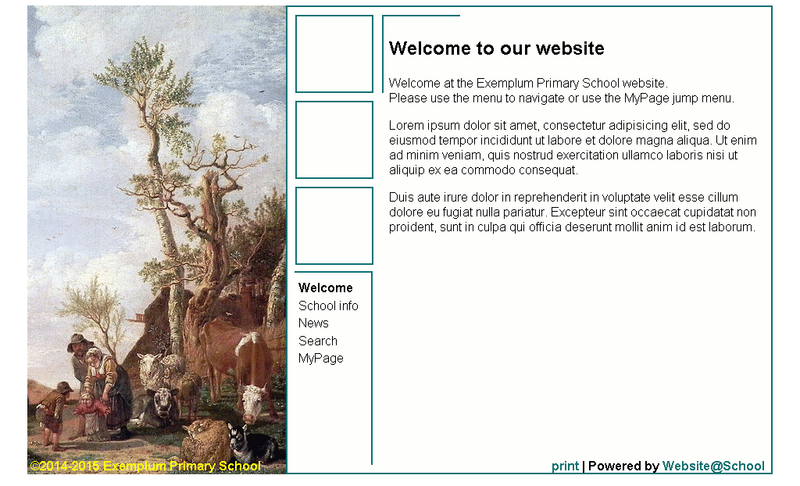 /file.php/areas/exemplum/print2.css. Observe the leading slash!